Is There Any Hope for the Pound? Compared to the Euro, the Pound is Gold (figuratively speaking). Compared to everything else, well, the Pound is probably closer to linoleum. 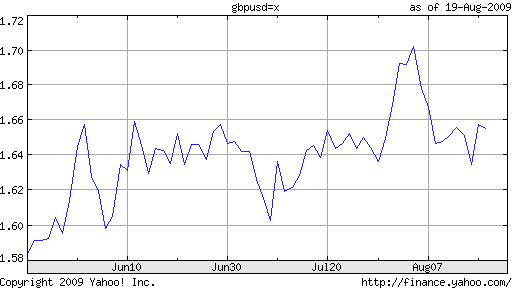 Bad geology metaphors notwithstanding, there really isn’t much to get excited about when looking at the Pound. Even aside from the imminent UK fiscal crisis, there is the fact that its economy continues to stagnate, its capital markets remain languid, and its balance of trade remains perennially mired in deficit. “Figures from the Office for National Statistics (ONS) showed that gap between the UK’s imports and exports hit a massive £7.5bn in March. 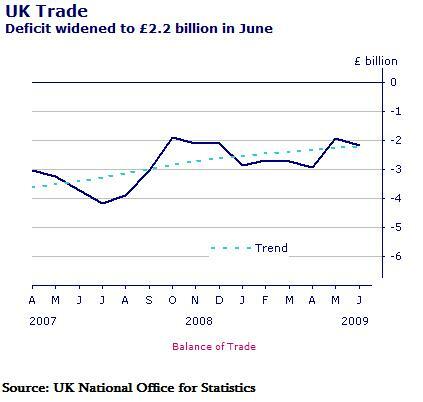 The deficit — well ahead of an upwardly revised £6.3bn for |February — came as total imports surged £1.4bn over the month compared with a meagre £200m rise in exports.” From a fundamental standpoint, then, there is very little reason to own the Pound. The picture is slightly more nuanced, when viewed through the lens of technical analysis. The most recent Commitment of Traders report, meanwhile, has showed short interest in the Pound building to record levels. 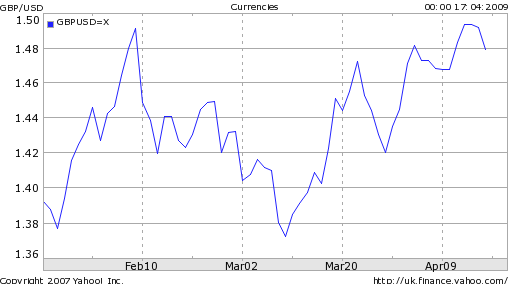 In addition, the ratio of long/short positions is approaching 5:1. Some analysts believe this is inherently unsustainable, and that as net positions become more lopsided, a sharp reversal becomes even more likely. 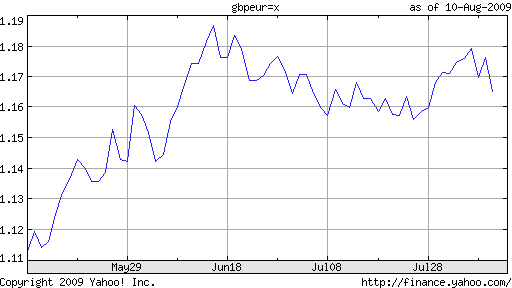 Then again, some analysts had the same theory about the Euro, which was solidly disproved after the short-squeeze rally was soon followed by a steady decline and a re-accumulation of short positions. Other technical analysts are waiting to see where the Pound moves in the near-term before placing their bets. ” ‘Last week the market eroded the 15-month uptrend from the January 2009 low at $1.3500’…the $1.4255 Fibonacci level is the last defence for the pound ahead of the $1.3500 2009 low. For the downside pressure to be taken off, key resistance at $1.5055, the May 10 high, would need to break.’ ” The Pound is hovering dangerously close to a number of psychologically important levels. If it breaches $1.40, it would signal a 5-year low. 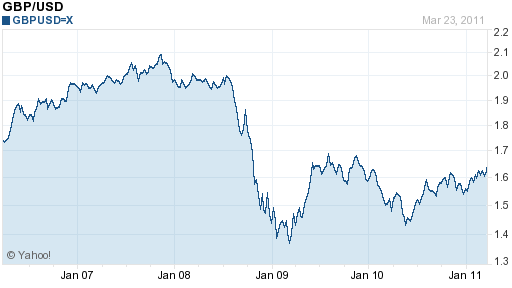 Consider also that the Pound last touched $1.38 in 2001 and $1.35 in 1987. 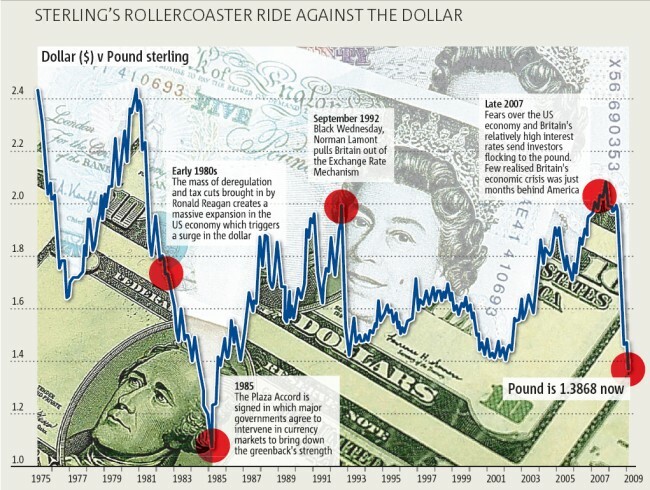 To be fair, the Pound has hovered around $1.50 for most of the last 20 years, so its current level against the Dollar is not that low, relatively speaking. If investors come to their senses, and realize that the likelihood of UK sovereign default is probably not any higher than the US, and the coalition government is able to produce a convincing plan for reducing the deficit, then the Pound could bounce back. If the safe-haven mentality remains in force, however, the Pound will continue to be one of the big losers. 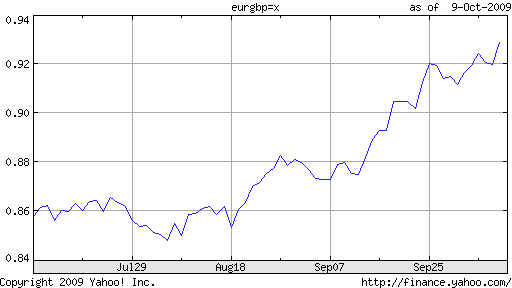 From trough to peak (March 10 – August 5), the British Pound appreciated by a whopping 25%, its strongest performance in such a short time period since 1985. 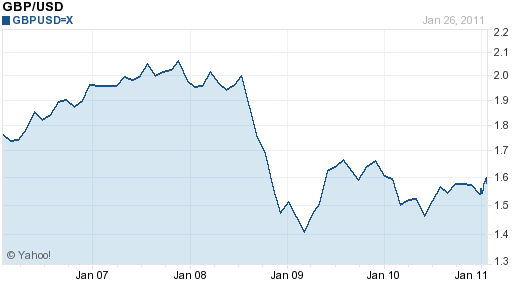 The Pound has fallen mightily since then, and most factors point to a continued decline. In addition, the only signs of growth appear to be a direct result of government spending, a notion that is evidenced by the latest retail sales and housing market data, both of which remain at depressed levels. “People are worried that the global recovery is based on unsustainable government spending and numbers like this from the U.K. only encourage those fears,” said one analyst in response. While government spending, meanwhile, is arguably a valuable tool for stimulating economic growth, analysts worry that it might be reaching the limits of feasibility. 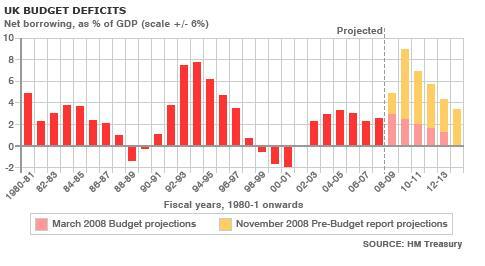 “The Office for National Statistics said the budget shortfall was 8 billion pounds ($13.2 billion), the largest for July since records began in 1993.” On an annual basis, the government is planning to issue 220 Billion Pounds in new debt, to fund a budget deficit currently projected at 12.4% of GDP, easily the largest since World War II. The Bank of England’s prescription for the country’s economic woes are also provoking a backlash. When the Bank announced at its last monetary policy meeting that it would expand its quantitative easing program by 50 Billion Pounds, the markets were aghast. Imagine investor shock, when the minutes from that meeting were released last week, revealing that 3 dissenting governors were agitating for an even bigger outlay! No less than Mervyn King, the head of the bank, “push[ed] to expand the central bank’s bond-purchase program to 200 billion pounds ($329 billion). Given the dovishness that this implies, combined with an inflation rate that is rapidly approaching 0%, investors have rightfully concluded that the Bank is nowhere near ready to raise interest rates. 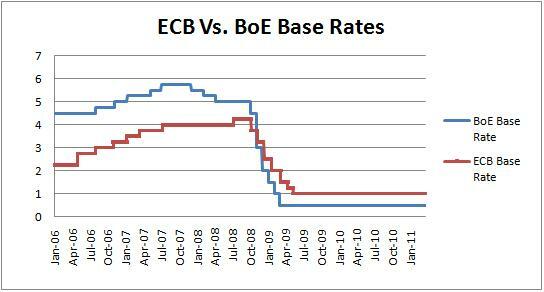 “The market was expecting the BOE to be one of the first to hike rates. It’s becoming clear that’s unlikely, undermining the pound,” conceded one economist. Interest rate futures reflect an expectation that the Bank will hold rates at least until next spring. 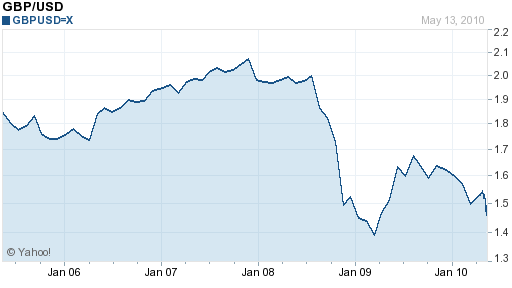 LIBOR rates, meanwhile, just touched a record low. Since then, however, a series of negative developments have cast doubt on such optimism. The first was the release of economic data, which indicated an unexpected widening in Britain’s trade deficit. While exports rose, imports rose even faster, causing analysts to wonder whether it would be realistic to expect the British economic recovery would be led by exports: “We remain skeptical that the U.K. is about to become an export-driven economy any time soon. A return to sustained growth continues to look unlikely in the near term,” said one economist. The second development was the decision by the Bank of England to expand its quantitative easing program: “The central bank spent 125 billion pounds since March as part of the asset-purchase program and had permission to use as much as 150 billion pounds, about 10 percent of Britain’s gross domestic product. Chancellor of the Exchequer Alistair Darling has now authorized an extra 25 billion pounds.” This came as a huge shock to investors, which had collectively assumed that the program had already been concluded. The prognosis for UK economic recovery should receive some clarity tomorrow, when the Bank of England releases a report on inflation and GDP. At this point, we will have a better idea as to what to expect from the Pound going forward. The Pound is holding its own against the USD, even touching a four-month high last week. But against other major currencies, the story is just the opposite. 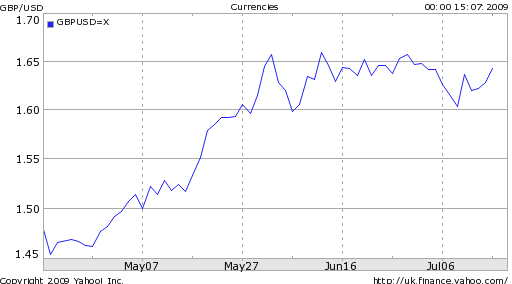 While managing to avoid parity against the Euro, for example, the Pound has nonetheless remained range-bound against the common currency. 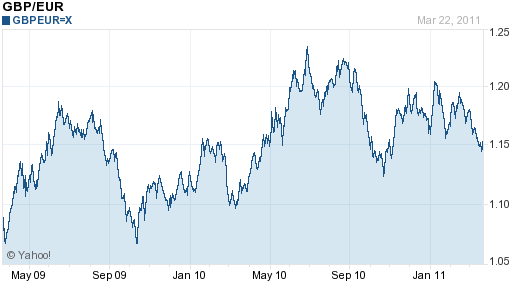 The Australian Dollar, meanwhile, has risen to $2 against the Pound for the first time in 13 years. How to explain the stagnation of the Pound? 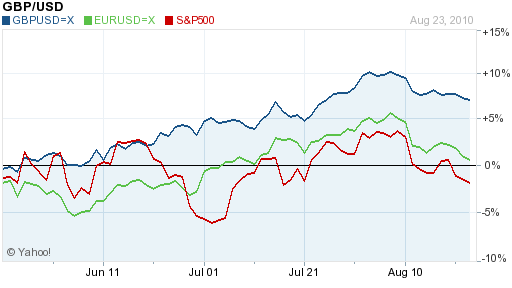 It depends on which currency pair you look at. Against the Dollar, the narrative remains one of risk aversion; when stocks rise, so usually does the Pound. “The U.K. pound is joining other currencies in beating up on the dollar,” announced one analyst on a day that stocks and commodities rallied broadly. The Pound has also been able to hold its own against the Dollar because both currencies’ Central banks have embarked on similar quantitative easing plans, which could prove equally inflationary in the long run. [Chart courtesy of Economist]. 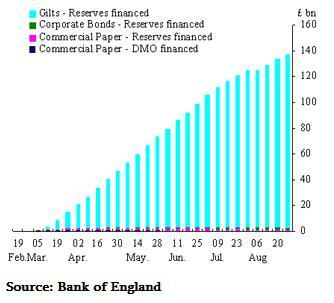 In fact, the Bank of England just announced a huge expansion in its program, increasing total debt buying (i.e. money printing) by $50 Billion. One analyst summarized the impact of this announcement on forex markets as follows: “The Bank of England’s aggressive stance with regard to quantitative easing is adding to concern about the economy and that is negative for sterling.” Not much nuance there…. 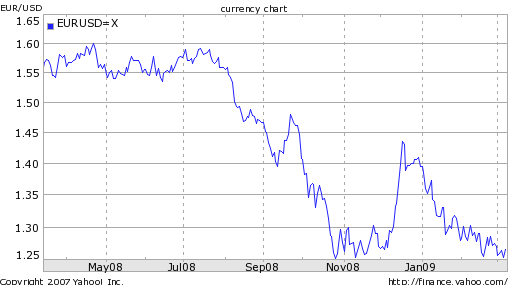 In fact, this is especially bad for the Pound against the Euro, where a juxtaposition of the Central Banks’ respective approaches to the credit crisis reveals stark differences: “The weakness in the pound suggests the market is drawing a contrast between the ECB, which seems to be dragging its legs on quantitative easing, and the BOE, which is still ‘full-steam ahead.’ ” Where the ECB is providing liquidity indirectly in the form of swaps and guarantees, the BOE is printing money and injecting it right into capital markets. “Mervyn King, governor of the Bank of England, has said the exit strategy will be dictated by the outlook for inflation and that central banks should not support markets that cannot survive on their own,” but investors remain skeptical and for good reason. “Britain will sell a record 220 billion pounds of gilts this fiscal year, 50 percent more than last year.” Based on the fact that yields have risen for four straight weeks (against the backdrop of the first “failed” auction ever for UK government bonds), there is doubt that the government can finance its deficits. The BOE continues to be roundly smacked with criticism, for its role in fomenting the credit crisis and in not adequately responding to it: “It happens that in the early years of inflation targeting, it did produce a stable economy. But I think it’s now clear that it can’t, by itself, produce a stable economy,” argued one commentator. Unemployment rates in the UK remain at frighteningly high levels. The government’s own economists (which are more optimistic than third-party forecasts) forecast GDP at -3.5% for 2009, with a modest recovery in 2010. Of course, these forecasts should be taken with a grain of salt, as they hinge on the crucial assumption that the BOE’s interest rate cuts and quantitative easing plan will soon trickle down through the economy, proof of which has still not been observed. 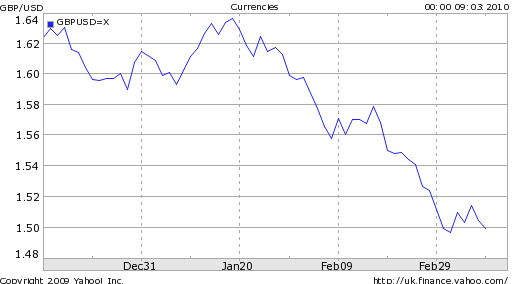 As a result, I’m personally between neutral and bearish for the UK Pound. For as long as stocks continue to rally, investors will remain Adistracted. 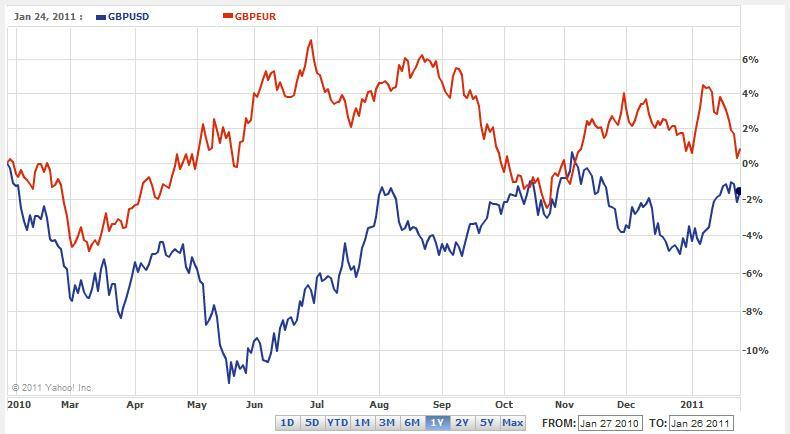 If and when the rally loses steam (I am skeptical that the rally is sustainable), they will quickly turn their attention to comparative economic and monetary conditions; suffice it to say that Pound won’t stack up well. Housing, industrial trends, consumer spending and public borrowing readings…provide additional confirmation that this evolving recession will be far worse than the slump of 1992. Last week, the Bank of England acquieced to the seriousness of the credit crisis by cutting its benchmark interest rate by 150 basis points- the largest margin in nearly two decades. While the move was intended to restore confidence in the UK economy and its financial markets, the opposite result obtained. In other words, investors interpreted the rate cut as an indication that the UK economic situation is even more precarious than was initially feared. In fact, this bearish sentiment is born out by economic data, which shows falling home prices and rising unemployment. 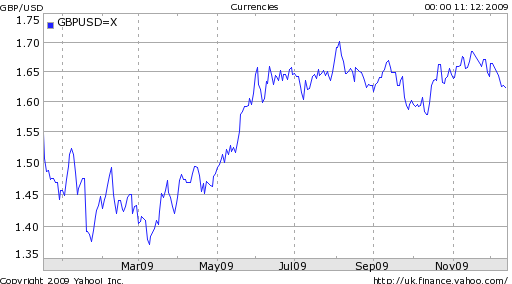 Since peaking against the Dollar late last year, the British Pound has since declined 25%. Worldwide interest rate forecasts are being revised downward, which has increased interest in the US where rates have already been slashed. Euro zone economic uncertainty was "particularly high," the European Central Bank president, Jean-Claude Trichet, said after the ECB left its interest rates at 4.25 percent on Thursday. [One analyst] is…a long-term bear on the British pound and believes any rallies in the currency represent an opportunity to enter short at a better price. Selling the pound against the dollar with a 10-12 month time frame may present one of the best opportunities in the currency markets today. Mr King contrasted his position – and its focus on controlling inflation – with that of Ben Bernanke of the US Federal Reserve. “We did not fall prey to the sirens to cut interest rates further as some other central banks have done,’’ he said. Even the movement in the markets over a couple of days can make the difference between owning a property and no longer being able to afford it. 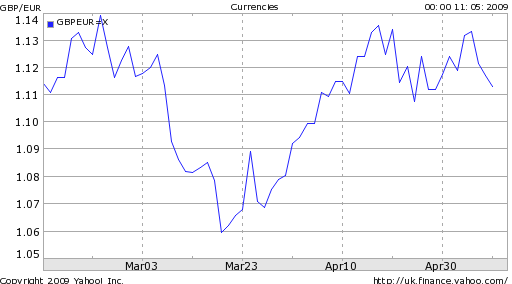 The European Central Bank (ECB) will likely maintain its benchmark interest rate at 4.00% at its meeting his week. The Bank of England is also expected to hold its lending rate in place, at 5.75%. While these two moves should be seen by Dollar bulls as acts of clemency, they are more akin to a stay of execution than to a commutation of its death sentence. The reasoning is that it is inevitable that the US-EU interest rate difference will be bridged over the next few months, as the Fed continues to lower rates while the ECB is in the process of hiking them. The only question is when. Accordingly, analysts will be paying close attention to the language employed by the heads of the various Central Banks at their next meetings to get a sense of timing. Since the beginning of 2007, the Bank of England has raised Britain’s benchmark interest rate by 50 basis points, to 5.50%. While the Bank voted earlier this month to maintain rates at current levels, many analysts are speculating that it will resume hiking rates again in July. A recent spate of economic data has supported the notion that Britain’s economy is on stable ground. As a result, the specter of inflation is once again looming, and the Bank, which has a reputation for monetary hawkishness, will be quick to act if inflation stays above the Bank’s comfort level. While the rate hike could certainly put a damper on Britain’s economy, it is likely to feed continued short-term interest in the Pound, is a viable risk-free alternative to the USD. Today saw the release of the ‘minutes’ from last month’s meeting of the UK Central Reserve Bank, revealing that members of the Bank’s monetary policy committee voted 7-2 to hold rates at their current levels. That there were two dissenting votes is confirmation to some economists that the Bank is planning to hike rates again in the near-term, perhaps as soon as March. British short-term interest rates, at 5.25% are already on par with American rates, and another rate hike would further lessen the appeal of risk-averse investment in America. Investors will be eying inflation data closely over the coming weeks, which could provide the impetus for a rate hike at the next meeting. “Forward contracts are a great way for people looking to move to the US to take advantage of the favourable exchange rate.” In essence, a ‘forward contract’ means that you can buy the currency now and pay for it later. The statement [of the UK Central Bank] did not give any clear signals as to the future path of UK interest rates and as such came as a disappointment to sterling bulls given the high probability that was attached to a follow-up rate rise in the first quarter of 2007. 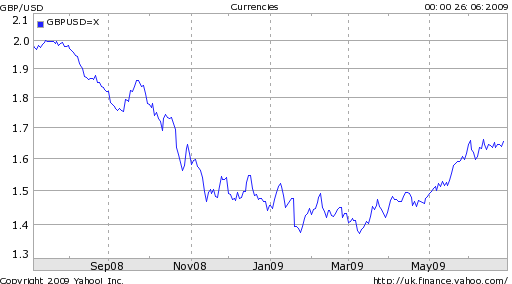 From the euro’s launch in January 1999 until 2003, the pound initially traded in a wide 21.1 per cent range against the euro. Since then, volatility has been significantly reduced with the trading range falling to 8.6 per cent in 2004 and 7.1 in 2005. By mid-afternoon in New York, the pound was 0.5 per cent higher at a one-week high of $1.8700 against the dollar and up 0.4 per cent to £0.6707 against the euro. The strong chance of feeble growth in the second quarter—the National Institute of Economic and Social Research is forecasting a rise in GDP of only 0.3%—means that a cut in August is on the cards. In a poll of economists on July 5th by Reuters, 26 out of 43 said that rates would fall next month. THE Forex market’s argument is that practitioner regulation, or self-regulation, is a better tool in fighting tricks of the trade and loophole hunting, rather than forced compliance with a one-size-fits-all rule.